The Major Planning Development Committee reviewed progress on the scheme and heard representations from local residents, the Council’s Design Champion and the developers. The Committee was most concerned about the height and bulk of the proposed residential enabling development and asked officers to discuss reducing the impact of the scheme on the conservation area and the setting of the listed building. The Committee was very supportive of the proposals for the Design Museum to use the Commonwealth Institute building and given the appropriate nature of this use accepted the argument that there would need to be radical changes to the interior of the listed building. The Committee asked officers to continue negotiations with the developer and to bring the application back to the Committee for a final decision in due course. The Friends' statement to the Major Planning Development Committee meeting on 7 July 2009. The Friends’ first objective is: “to secure the preservation, protection and improvement of Holland Park as a place of historic and ecological interest and beauty”. We would be failing in our duty if we did not oppose the detrimental impact of this application on the Park and users’ enjoyment of it. 1. Heights of the three residential buildings. 2. Removal of the northern boundary wall. 3. Loss of trees on the site boundary. 4. Possibility of changes to the main entrance to the Park and loss of parkland. Two of the proposed residential blocks are higher than the ‘tent’ and all three will project above the line of the ‘tent’ when viewed from the terrace below Holland House. The Holland Park Conservation Statement says that this is the first view to be preserved and enhanced within the conservation area. This policy document is fully endorsed by the Tall Buildings SPD. Quote: ‘In line with the London Plan the UDP also protects London’s skyline and strategic views. … the borough’s aim is…to resist proposals that would encroach upon or adversely affect the setting of Holland Park (CD15) …’ . Even ‘The Tent in the Park’ SPD concedes that The Holland Park Conservation Statement “will carry significant weight”. The application fails in this respect as the proposed buildings are clearly visible from Holland House, spoiling the skyline of the Commonwealth Institute and prejudicing the park setting, and should therefore be resisted strongly. We are alarmed at the plans to demolish parts of the northern perimeter wall and that these proposals were encouraged by the SPD. The wall is the established boundary between the Park and the site, built before the Commonwealth Institute. It provides shielding from the hustle, bustle and unwelcome intrusion of the world outside. The idea that the ‘tent’ should be integrated with the Park, after almost 50 years, is entirely spurious and a deceitful inducement to the developer. It is not in the Park, it never has been and it has absolutely no right to be. It is neither owned by The Royal Borough nor in any form of public ownership, but is being developed by a commercial organisation for financial gain. Why should preferential treatment be given to the few at the expense of all other local residents’ enjoyment of their Park? No other property adjoining the Park would be given such rights. The Park is a separate, protected world from the one outside. That is why it is so popular. It is beautiful, tranquil and good for the soul. Users leave the outside world behind. The north wall must be retained in toto. Quote: “…needs to be reinforced and protected by the establishment of regenerating tree belts …”. The Commonwealth Institute building was set at an angle to preserve existing trees. Many of those will now be felled to allow an enlarged opening into the Park on the eastern perimeter and, in particular, one large tree will be felled to permit access to the new café from the new basement. It is a dreadful loss of fine, mature trees for so little benefit and should be resisted. There is a suggestion in the SPD that the listed main gate to the Park be moved further into the Park and the south eastern finger of the Park be absorbed into the site. This is completely unacceptable to The Friends - as it should be to The Royal Borough. The Borough is desperately short of open space, parkland is at an absolute premium and The Royal Borough refers to Holland Park as ‘the jewel in its crown’. It seems they now want to sell off the crown jewels and that must be strongly resisted. Previous attempts to reduce the size of the Park were unsuccessful. That was largely due to the Council recognising the importance of Holland Park to the residents. It is unbelievable that the Council should now abandon its support in favour of a commercial development. This would encourage other such applications and lead to the piecemeal destruction of the Park when the need for it has never been greater. In summary, if these proposals are permitted, it will show the Borough’s complete disdain for the well-being of Holland Park and its users. We find it simply amazing and inexcusable that The Friends should have to defend the Park against its owner’s support of a commercial developer. We ask you to refuse planning permission. Chairman, The Friends of Holland Park. The developers of the Commonwealth Institute - the Parabola - have submitted a planning application to RBKC. The Friends have great concern about the potential impact on the Park if this application is approved. We have therefore joined forces with ESSA - Edwardes Square Scarsdale & Abingdon Association - to oppose the plans in so far as they concern the Park. ESSA's case is reproduced below. The Friends have submitted formally their objections - see below. We urge all members with a real concern for the Park to write to the Planning Department, but time is short. To be included in the Officers' report to the Major Planning Committee, your objections must be received before mid-June, but objections received before a decision is taken will still be taken into consideration. Please write. ESSA seeks your support in objecting to this ill-conceived, insensitive and fundamentally flawed development of a Grade II* listed building and its surroundings. It will be considered by the planning committee on the 7th July, despite the fact that the Council’s Design Brief (which has been nearly two years in gestation) has, at 25th May, still not been formally published! The ESSA membership is concerned at the lack of proper appreciation and understanding of the building from a cultural, functional and architectural standpoint. To help remedy this situation, and in conjunction with other local groups (see below) who share our concerns, we commissioned an independent assessment of the building. The applicant has arranged a further public display on the 17th and 18th June, however, as the planners’ timetable requires that their report be finalised by the 19th June, the exhibition date will be too late for subsequent representations by individuals to be taken into account. We urge you to comment several days before the 19th June: the application can be seen in the planning department at the Town Hall or online at http://www.rbkc.gov.uk/planning/scripts/documentsdrawings.asp?caseyear=09&casetype=PP&caseno=00839&provider=idox. The case number is 00839. • The applicant has not made a proper comprehensive conservation assessment of the building and has relied on out of date advice from English Heritage which has now, importantly, been superseded by their letter of 19th December 2008. • From ESSA’s investigations there are potential uses which would allow retention of the buildings generally in their current form and would not require extensive and/or invasive alterations. • The applicant, while indicating that the Design Museum might be an occupant, has made no commitment to that effect and we could face a position with an empty shell with the applicant having the benefit of a substantial residential development. The applicant has not demonstrated what would be the requirements of either a museum or other user nor that these could not be satisfied by the building as existing or with minor modifications. • The applicant, by removing the two supporting wings, would be left with an unusable main hall and thus, in order to provide equivalent accommodation to that which was demolished, would have to cut out the interior of a building which has been described as being the work of the foremost interior designer of its time. • To fund these unsuitable interventions the applicant has applied for consent for three large, overbearing residential blocks which obstruct the views of the listed building. • In doing so the applicant has ignored the specific requirement in the Holland Park Conservation Area Statement, prepared and adopted by RBKC, that no new high buildings should be visible from Holland House in order to preserve the qualities of the Park. • The illustration at the end of the non-technical summary shows that the new towers will dominate totally the supposedly iconic ‘tent’ of the existing building and be completely out of scale with the surroundings in the High Street. • The loss of the open space facing on to the High Street will be detrimental to the character and amenity of that street. • There will be a reduction in open public space and a loss of protected trees. • The proposed new buildings will be overbearing and harm the amenity of existing nearby residential accommodation. The scale of the building, with unduly high floor-to-floor heights is not in harmony with the surroundings. ESSA has been working with the Kensington Society, The Friends of Holland Park, the Campden Hill Residents Association, the Earls Court Society, the Melbury Court and Troy Court residents associations, the Philimore Estate and many other local representatives as well as the 20th Century Society, SAVE Britain's Heritage and the World Monuments Fund, many of whom have already lodged their objections. We urge you to add your voice to object to these detrimental proposals and to encourage the Royal Borough of Kensington and Chelsea to take further steps to protect our environment and maintain a heritage worthy of our Borough. I am writing on behalf of The Friends of Holland Park to object most strongly to those elements of the developer’s proposals which impinge directly and detrimentally on Holland Park and people’s enjoyment of it. We have previously alerted you to our views through the consultation process for the Supplementary Planning Document, but sadly it seems they were not listened to. We are most concerned about the height of the proposed new residential blocks. Two of them will be higher than the ‘tent’ and all three will project above the line of the ‘tent’ when viewed from the terrace below Holland House. ‘The enclosure [the Park] needs to be reinforced and protected by (a) establishment of regenerating tree belts and (b) limitation of the height of new buildings outside the Park which might impinge on skylines seen from within the Park’. ‘The London Plan recognises the value of London’s historic built environment and the need to protect its most important and cherished views. In line with the London Plan this document identifies landmark buildings as well as London panoramas…[including] Lp2: Holland Park (CD15)...landmarks…[including] L15: The Commonwealth Institute’. The developer’s proposals fly in the face of these established planning guidelines and should therefore be resisted strongly. We note with alarm the developer’s plans to demolish parts of the northern boundary wall and that their proposals are supported by the SPD. We have argued against such a change in both the SPD consultations. This wall is the established boundary between the Park and the Commonwealth Institute site and it provides the necessary full stop to the Park, shielding it from the noise and bustle outside. The idea that the ‘tent’ should now be integrated within the Park, some 47 years after its construction, is entirely spurious. It is not within the Park and it has absolutely no right to be considered within it. It is neither owned by The Royal Borough nor in any form of public ownership, but is being developed by a commercial organisation for financial gain. What possible right does the developer have to be given preferential treatment for his development at the expense of all other local residents in their enjoyment of the Park? This is wrong and the developer should not have been given the Borough’s encouragement. No other resident adjoining the Park would be given such rights. What may have been considered 50 years ago was not taken forward at that time for very good reason and should not be resurrected now for the sole benefit of a commercial developer. There can be no reciprocal benefit accruing to the Park or its users. The whole point about the Park is that it is a separate world from the one outside. It is quiet, tranquil and good for the soul. You can hear birdsong above the roar of traffic and your spirits are restored. This entirely supports our view that the existing wall to the north of the Commonwealth Institute site must be retained. However, we would not oppose replacing the wall to the east of the site with secure, quality railings. Within the applicant’s documentation there is the suggestion that the Kensington High Street gated entrance to the Park should be moved to line up with the northern boundary wall between the Park and the Commonwealth Institute site. This is completely unacceptable to The Friends - as it should be to the Park’s owner, The Royal Borough. We are for ever being told just how short the borough is of open space, that parkland is at an absolute premium and that Holland Park is ‘the jewel in the crown’. To reduce the size of the Park in this way would be the equivalent of selling off the crown jewels without any reciprocal benefit and should be resisted at all cost. Holland Park is also an area of Metropolitan Importance and a Conservation Area and as such must be fully protected, preserved and enhanced. If the proposals under these three main areas of our concern – the proposed building heights, the changes to the boundaries and the main entrance – are allowed to proceed, and they are all seemingly supported by the planning department, it will show The Royal Borough’s complete disinterest in and disdain for the well-being of Holland Park. We find it amazing and inexcusable that we should have to defend the Park against its owner’s intended actions. 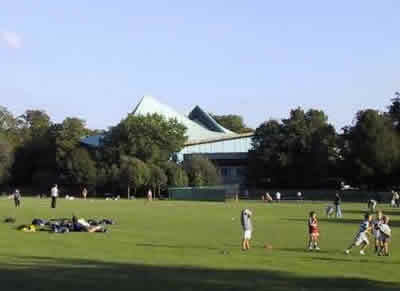 Already, plans for the new Holland Park School have resulted in the playground site having to be sold off for redevelopment as a high rise block of flats, which are immediately adjacent to the Park and very intrusive. If these Commonwealth Institute proposals are also given planning approval, it will be yet another step in the gradual destruction of Holland Park’s peace, beauty and attraction. It simply must not be allowed to happen and we ask you to refuse planning permission for these proposed changes. Sir Angus Stirling’s presentation to the RBKC Major Planning Development Committee Meeting held on Thursday September 17th 2009. My name is Angus Stirling. I speak this evening as the President of The Friends of Holland Park. My comments on behalf of the Friends are made solely in the context of our primary objective, which is “to secure the preservation, protection and improvement of Holland Park as a place of historic interest and beauty.” I should like to preface my remarks by saying that we appreciate that the principle of sensitive and imaginative development on the site of the Institute, which protects the integrity of this listed building, and gives it a fresh purpose, is in itself desirable. We try to approach applications in a constructive manner and not to adopt a policy of automatic resistance to change. However, it is our duty to respond to applications affecting the Park in the context of the objective I have referred to. In July we stated our reasons for believing that the original proposals would be severely detrimental to the Park, under four main heads: The height of the three residential buildings. The removal of and changes to part of the northern boundary wall. Loss of trees on the site boundary. Possible changes to the main entrance. This last no longer applies. In the short time available we have carefully studied the revised application submitted by the developers. Let me take first the issue of the height of the residential buildings: Paragraph 3.34 of the Borough’s Report on the revised application summarises the changes offered to the building sizes. It shows there that High Street Building A and Garden Building B have each been reduced by one storey, respectively from 8 to 7 and 9 to 8; Park building C is unchanged at 6 storeys. Taking the details from the Report the average height of these three buildings to the parapet after the revisions will be 27 metres, or approximately 80 feet. There are minimal adjustments of floor to floor to heights. The Holland Park Conservation Statement states that the first view to be preserved and enhanced within the Conservation Area is the tent viewed from the Terrace below Holland House, and I quote: “No new high rise buildings should be erected that could be seen from the terrace. The sky-lines to the South of the Park should not be further intruded upon.” This statement does not say: “…….should not be significantly intruded upon” or “greatly intruded upon.” It says unequivocally that the sky-lines should not be further intruded upon at all. Against this clear policy, the fact that other tall buildings exist in the vicinity is irrelevant, and the word “further” shows that the Borough is aware of the present position and does not wish it to deteriorate. This policy document is fully endorsed by the Tall Buildings SPD, which states inter alia that the Borough’s aim is to resist proposals that would encroach upon or adversely affect the setting of Holland Park. We strongly take the view that the alterations to the heights of these buildings proposed in the revised application do nothing whatsoever to overcome the objections we raised in the first place. The Garden Building remains clearly visible from the Park, disrupting the skyline of the Commonwealth Institute and its appearance. The Park Building dominates the view from the Park, and destroys the sweep of the tent roof which is fundamental to its character. It is hard to avoid the conclusion that these changes are merely scraps thrown to the responsible conservation bodies from the back of the sledge, in the cynical hope that that would delude us into thinking that the height of these buildings is no longer an issue. The fact is that these remain high rise buildings that drive a coach and horses through the Borough’s own established policy to protect Holland Park and its setting – one of the acknowledged jewels not just in this Borough’s crown, but that of the capital itself. We understand that the Council has to consider balancing the arguments as Mr Prout has described; but we submit that the balancing act should not, for expediency’s sake, erode the principles set by the Borough Council itself for the protection of the Park. Our objections to the demolition of parts of the wall have already been made clear by our Chairman in his submission to the Planning Committee on July 7th. The wall is a crucial element in the physical definition of the Park’s own space and the enjoyment of that space by the public. We deplore the concept of replacing part of the boundary by fencing. To do so would blur the important separation between the urban bustle of Kensington High Street and the rural tranquillity and integrity of the Park. In the view of the Friends it is essential to preserve that distinction, and the whole of the boundary wall should remain intact. Turning to the trees, we note that the applicant has reduced the proposed felling of trees from 34 to 31 and the retention of trees from 19 to 25. Our view is that the loss of 31 trees remains too many; no private owner would be permitted to fell one tree subject to a TPO. All trees in sound condition in and near the Park or the High Street are valuable and the aim should be to protect them. May I finish by reminding the Committee of the conclusion to the letter of Mr Philip Davies of English Heritage to David Prout, dated 21 August: “The site deserves a conservation-led approach which places an understanding of the significance of the entire composition at the heart of the proposals for change. In our view, a substantial rethink is required before the proposals could gain our support.” These proposals in our view fall far short of a substantial rethink as far as the effect on Holland Park is concerned, nor are they conservation led. We earnestly hope that this damaging application will be rejected. Last chance to save it? RBKC's Major Planning Development Committee meets on Thursday 17 September to take a decision. The Planning Officers' recommendation is to grant consent. As a result, the Kensington Society, with the support of The Friends and others, has requested the Secretary of State to call in the application. The applicant has submitted revised proposals and it is likely that a decision will be taken at the Major Planning Development Committee (MPDC) meeting on 17 September. The RBKC Planning Department’s report and recommendation is being written now, and it is vital that as many individual letters of objection as possible are received by the Planning Department before the date of the meeting to be taken into account. As you will see in previous postings below, The Friends objected to the original proposal primarily on the grounds of the excessive height of the three new residential blocks, spoiling the views of ‘The Tent’ and the more distant views looking over the building from the terrace of Holland House, a protected view. The MPDC meeting on 7 July demanded a substantial reduction in the height of the residential blocks. What has now been proposed is no change to the footprints of the blocks and just a slight reduction in their respective heights. They will still dominate, overshadow and dwarf the Commonwealth Institute building when seen from the Park and interfere with the skyline when viewed from the Park. There is a minimal reduction in height of the ‘Park Building’, but it still dominates the view from Holland Park, rising above the eaves of the parabola and destroying the sweep of the roof which is visible from the Park, thus adversely affecting the skyline supposedly protected by the Holland Park Conservation Statement. The applicant also claims that with the reductions in height the ‘Garden Building’ will not be visible from Holland Park. This is not correct; the building heights are totally unacceptable. The changes are simply a gesture to meet some of the concerns of the MPDC, but they are essentially cosmetic and the whole development is fundamentally unchanged, which means that our very strong objections remain. The development will adversely affect the parkland setting, which both we, constitutionally, and The Royal Borough, by planning law, are required to defend and protect. Please write to Mr David Prout, Executive Director, Planning and Borough Development, The Town Hall, Hornton Street, London W8 7NX. The meeting of RBKC's Major Planning Development Committee on 17 September voted by the narrowest of margins to allow the application to develop the Commonwealth Institute. The vote was 5:5, but was carried by the chairman's casting vote in favour. We have now learned that English Heritage, in an apparent volte-face, has decided not to oppose the Committee's decision so the one remaining hope is that the Government may yet decide to call in the application for public inquiry. The revised development proposals for the old Commonwealth Institute building and site were approved by RBKC’s Major Planning Development Committee on 17 September by the narrowest vote in its history – the chairman’s casting vote. Our President, Sir Angus Stirling, was one of several objectors who spoke passionately against the scheme, which drives a coach and horses through the listed status of the building and the site as a whole, damaging the setting and ambience of the park as it does so. Since then, representations have been made to Government to call in the application for the Secretary of State’s determination. This would necessitate a public planning inquiry. At present the Government Office for London is seeking further information from the Council and from English Heritage before taking a decision on whether or not to call in the application.